I’ve been in the United States for over a week now and have managed to visit a number of museums and galleries in Fort Worth, Texas— including the Modern Art Museum of Fort Worth where I saw this work. I walked all around Fort Worth, despite being told you can't walk all around Fort Worth. And camped for four days at the Texas Motor Speedway where I watched two NASCAR races and a number of qualifying and practice circuits by both Sprint Cup and Nationwide cars. There I had pork and beans cooked for me on a camp-fire by a Texan oil-man (like we were cowboys) while his construction-worker nephew gave me crap for having been to University not jail. But before I get too far into this trip covering the United States, United Kingdom and Spain, I want to cover off on two things I was involved in prior to flying out. 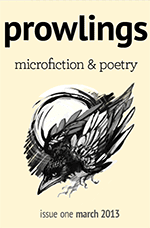 First, a while back Canberra's Pilcrow Press put out a call for submissions to their new journal Prowlings, with the requirement that submissions be short. I sent two pieces, the first is in their inaugural issue that you can download free here. I am pretty happy about being in this journal, my favourite piece in there is by M. Quinn. And don't confuse this Pilcrow Press with the one publishing literature justifying violence. Second, while taking part in the YouAreHere 2013 festival I spoke with Luke McGrath regarding an idea for recording my first video poem. It involved fusing a performance of Bruce Schneier cracks lamb leg with the band Fuzzsucker in the back seat of the car where Canberra’s Slimer Sessions have been recorded. The Slimer Sessions are recorded for Canberra’s LocalnLive music organisation. Luke and Fuzzsucker agreed and this piece is the result. This is my first effort at filming a poem, and with Luke’s skills and the charisma of Fuzzsucker I think we pulled off something worthwhile. Well I am now in Boston, I have tickets to Fenway Park for a baseball game to get my yank on, to the Boston Comicon to get my geek on, and to Kevin Smith’s Groovy Movie because I am a member of Gen X and when he makes Clerks III I am going to watch it and you will not understand.